Prior to the SUB being built, the closest thing the campus had for a student service center was a large area in the Kirk Building named Sociability Hall. One of the first official statements concerning a Student Union Building can be traced back to 1945 when a postwar planning committee of the faculty presented a report to then University President Walter Ryle recommending a Student Union in a 10-year building plan. 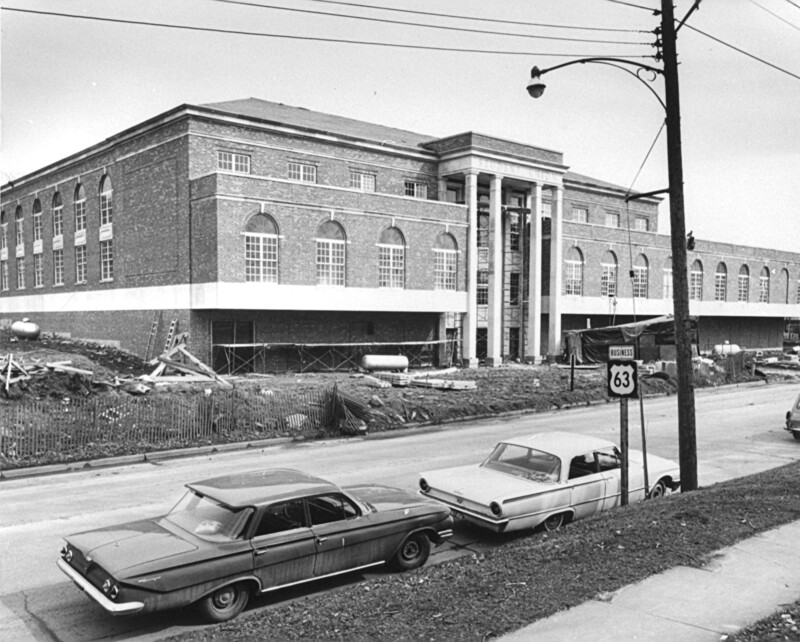 During the 1950s, students displayed a growing interest in having a Student Union Building, and several senior classes contributed to a Student Union Fund to help with furnishing the building. In 1960, the Board of Regents passed a resolution officially lending their support to the cause, and less than a year later, plans for the Student Union gained more momentum when the student body approved a Student Union fee. After funding for the project was finally approved, the ground-breaking ceremonies for the Student Union Building took place in March 1966. The total cost of the building upon completion, including equipment and interior decorations, was $2.5 million. 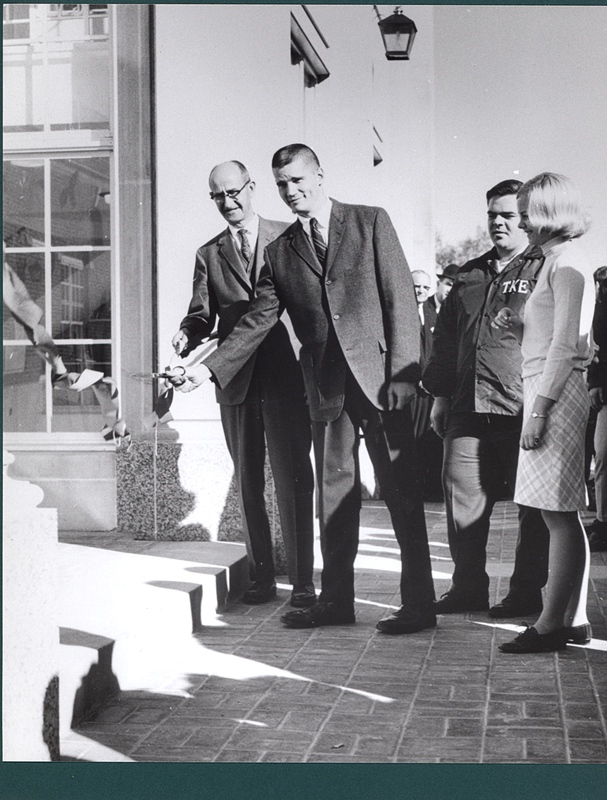 After decades of planning, the Student Union Building was officially opened on Oct. 20, 1967, and 2012 marked its 45th anniversary. The Student Union Building, a favorite locale where students can hang out, study and eat, has undergone several changes over the years. Although the exterior of the building has remained mostly the same since 1967, the inside of the Student Union has experienced many changes throughout the years. 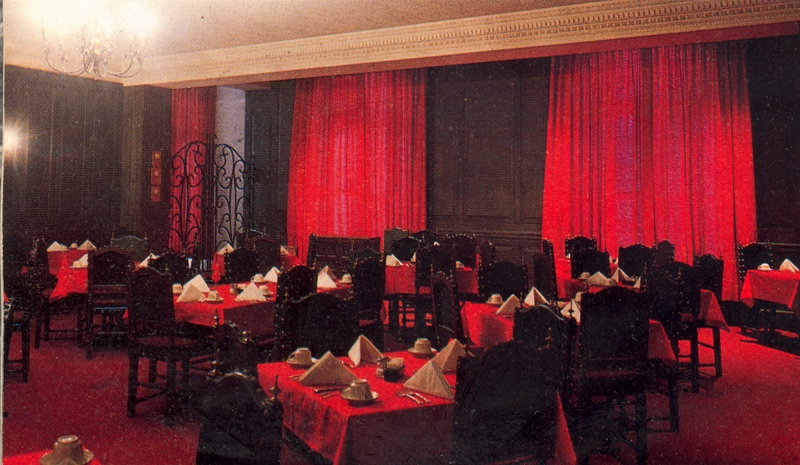 Major renovations in 1986, 1990, 1994 and 2006 have altered the layout and aesthetics of the interior of the building. The most recent renovation brought changes such as the conversion of the Quiet Lounge to the Hub, which included a new passenger elevator, staircase and seating; the addition of the south entrance on the lower level; and rest rooms added on the main floor. Dave Lusk, who has served as director of the Student Union Building since 2009, notes that the most recent renovations have made the facility more accessible and free-flowing. “As a result, the Student Union has seen a dramatic increase in students being in the building,” says Lusk. “Students use the Student Union as a place to meet friends for an informal group meeting and have a meal, coffee and smoothies, and it provides a place where students can gather for weekly organizational meetings and attend entertainment or educational programs.” The facility also provides a place where students can take a break from their studies, and Lusk says it’s not uncommon to come across students engaged in an impromptu game of chess or a strategy card game. Some of the other offices located in the Student Union include Greek Life, Funds Allotment Council (FAC), Student Organization Center (SOC) and the Women’s Resource Center. The University Bookstore, located on the lower level, provides textbooks and course materials, digital textbooks, apparel and accessories, school supplies and much more. The Down Under, a dance and entertainment area, is also on the lower level. Throughout the years, the Student Union has offered dining services for the Truman community. Today, Mainstreet Market, the food court area which replaced what was once known as the Snack Bar, offers a variety of options that include Original Burger, Godfather’s Pizza and Theme Cuisine featuring a variety of national and international menu items. In addition, Jazzman’s which features coffee and pastries, and Freshens, which offers yogurt and all-natural smoothies, are also located on the main level. Mainstreet Market, the food court area on the main level, offers a variety of options including Original Burger, Godfather’s Pizza and Theme Cuisine featuring a variety of national and international menu items. Since the very beginning, the Union has served as a focal point for programs, meetings, dining and relaxation for students, faculty, staff, alumni and off-campus visitors. As the community center for the campus, the Union continually seeks to serve as a unifying force in the life of the University. 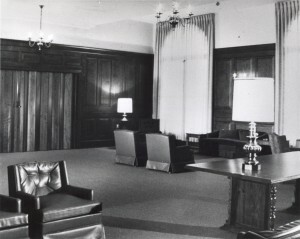 1930s–A large room on the ground floor in the Kirk Building is designated as “Sociability Hall.” This represents one of the University’s first undertakings to offer students facilities for activities. 1945–The postwar faculty planning committee recommends the future construction of a Student Union Building. June 1961–Students vote to approve a Student Union fee, and University President Walter Ryle recommends a student union fee of $8 per quarter to the Board of Regents. The Board arrives at a fee of $5 per quarter. April 1963–University President Walter Ryle appoints a Student Union Planning Committee consisting of students and faculty. July 1965–The University acquires all of the land necessary to construct the Student Union Building. 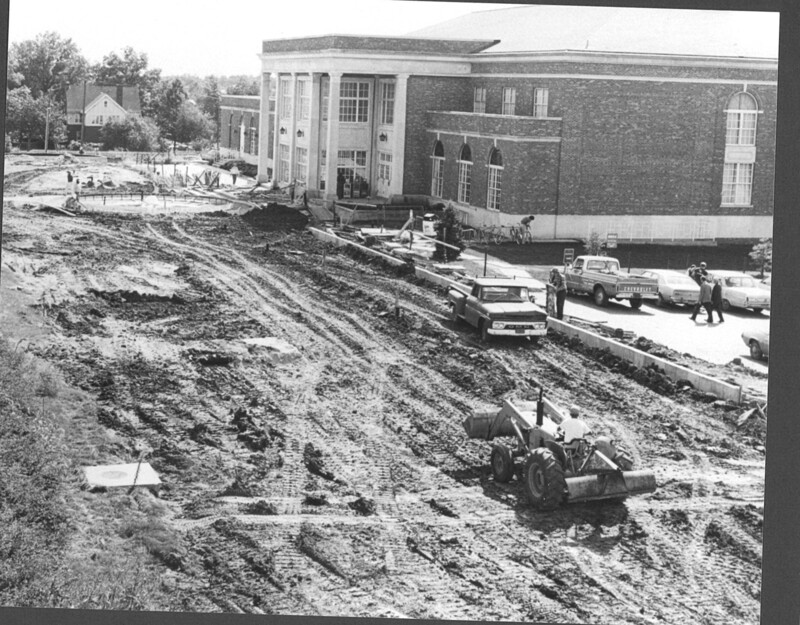 March 1966–The University hosts a groundbreaking ceremony with Student Council President Harry Libby presiding. This is believed to be the first official ceremony in Truman’s history that was organized and conducted solely by students. The Student Union is dedicated and the cornerstone is laid Aug. 9, 1966. October 1967–The Student Union officially opens at 10 a.m. Oct. 20, 48 days after the celebration of the University’s centennial. January 1973–Marion Street is closed and construction begins on the Mall. The Mall and fountain are completed in December of 1975. September 1975–To commemorate the U.S. bicentennial celebration, Professor William Unger is commissioned by the University to paint a mural modeled off the artistic style of painter Thomas Hart Benton. February 1984–A study of the feasibility and cost of renovating the Student Union begins. The study concludes that repair and renovation are needed in the building. 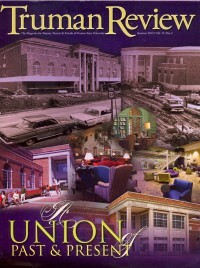 Areas targeted in the renovation included roof repairs; masonry work; expansion of the University Bookstore; furnishings in the Georgian Room, the Quiet Lounge and the Snack Bar. 1986–The first phase of the renovation begins with the relocation of student media offices, including the Index, Echo and KNEU, from Laughlin Hall to the lower level of the Union. Later on, during renovations made during the 2000s, the student media offices are moved to Barnett Hall. 1990–Planning commences for the renovation of the Snack Bar and the Games Room area. October 1991–The renovation of the Snack Bar is completed, and it is renamed Mainstreet Market. Improvements include new lighting and furnishings, reconfiguration of the serving area and the removal of the wall separating the windows and the dining area (formerly the Art Gallery). Late 1991–The bowling lanes are removed from the lower level. 1993–The Board of Governors grants approval for the renovation of the Games Room area. On-site construction begins April 1. February 1994–The University hosts a ribbon-cutting ceremony on Feb. 4 to celebrate the opening of the newly-renovated lower level. Improvements include a new Games Room area, multipurpose space, lounge seating, office space and student organization work areas. 2006–A new phase of renovations begins on the Student Union Building. Renovations to the Quiet Lounge include a new staircase and passenger elevator. A new entrance is added on the south side of the first floor. The Georgian Room is also renovated to allow the room to be sectioned off into three separate spaces. September 2008–The Quiet Lounge is renamed the Hub after student Libby Piel wins the University contest to rename the room. October 2012–The Student Union Building celebrates its 45th anniversary. The Student Union officially opened at 10 a.m. on Oct. 20, 1967, under the direction of Kenneth Sykes, who was the director for the next 12 years. A four-chair barbershop was located on the first floor when the Student Union opened in 1967. A dress code was enforced when the Student Union opened. Men were required to wear slacks, and women were required to wear dresses or sweaters and skirts in the dining areas. A copper box, placed in a niche of the SUB’s cornerstone, contained a number of items including newspaper articles about the Student Union Building. Student Union Director Kenneth Sykes and Student Council President Jack Wright at the Student Union ribbon-cutting ceremony in October 1967. 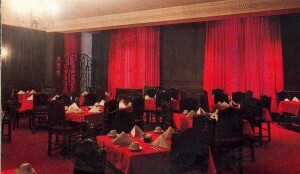 The Spanish room was a dining area in the SUB with seating for 64 guests. The chairs were imported from Spain, and the small chandeliers were designed in Mexico. Guests entered through a 12-foot wrought-iron gate shown in the upper left corner of the photo. Have a favorite memory of the Student Union Building? Send your story or photos to alumniandfriends@truman.edu. Bethany Williams (’13) contributed to this article. This entry was posted on July 22, 2013 by drood.